Hello peeps! Johnnie Walker® MAKE IT BLACK is finally here! I'm pretty excited about it, especially when it's Halloween. Have you got your costumes yet? It's okay if you haven't, because I still have no idea what I'm dressing up as this year. Johnnie Walker® KEEP WALKING now continues its journey to Johnnie Walker® CHARACTER series, collaborating with international artist, Mattia Biagi. Mattia Biagi is famous for his powerful black artworks, partnered with JOHNNIE WALKER® to find the perfect expression of the character of BLACK LABEL and show the powerful beauty of black. The scene is of dramatic transformation, as items symbolising classical luxury are turned strikingly black and intense with the use of paint and fire, and we are inspired to “HAVE BOLD TASTE AND INTENSE CHARACTER”. 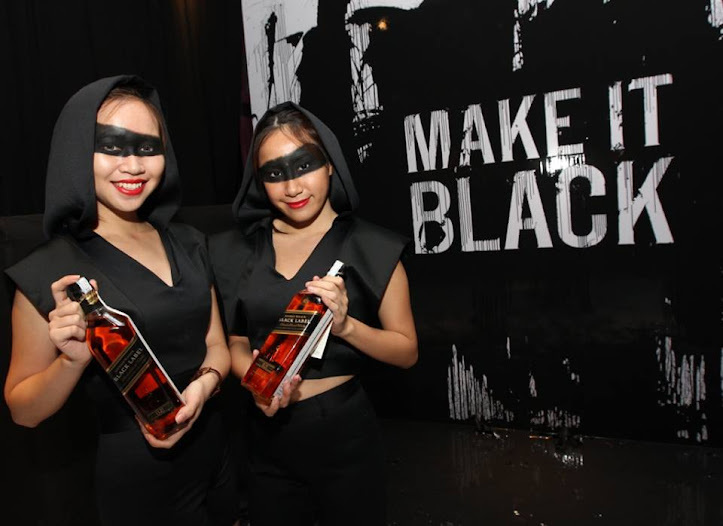 Johnnie Walker® MAKE IT BLACK will be happening this Friday 31st October 2014, 9pm.Taking it to a whole new level, this will be the largest and most exciting event the campaign has seen. This fresh direction celebrates the individual taste and personality profiles of the different JOHNNIE WALKER® variants. This Halloween, Johnnie Walker® is ready to blow us away with numerous local talents, and masters of crafts with a showcase performance. An event by invitation only as Johnnie Walker® wants to share this experience with the biggest fans of the brand to experience the beauty of black come to life.